Read through the list of verses with the “one-another” commands of Scripture and you’ll have to conclude that this kind of mutual, reciprocal relating with each other takes time. Church leaders serious about following God’s design for interdependence among the Body must etch time for Body life into their busy schedules. And, they must structure to allow for it to happen within the hectic church-wide schedule. How will we admonish one another (Col. 3:16), bear one another’s burdens (Gal. 6:2), build up each other (Rom. 14:19), care for one another (1 Cor. 12:25), and spur one another on (Heb. 10:24) if we haven’t taken time to learn each other’s needs? It’s hard to comfort (1 Thess. 4:18) or confess our faults (James 5:16) to one another if we don’t take time to listen to each other. 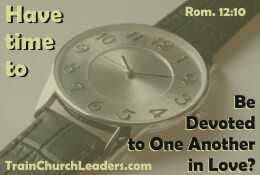 We could go on with all the one another commands to note the necessity of time. To sum it up, it’s very difficult to be devoted to one another (Rom. 12:10a) with people with whom we spend little time. We can got so consumed with all we have to do that little time remains for connecting and relating with one another. We might send a quick text on the fly but to sit down person-to-person, or even take time for a live phone conversation??? We can keep putting it off until getting together just doesn’t seem relevant anymore. Following God’s design for the Church takes us beyond programming to relationships. If we’re so busy planning and attending this and that program that we have no time left for living out the one another commands, then it’s critical to readjust our perspective on time management. 1) We must view our time as a stewardship. The One who ordained our days on this earth (Ps. 139:16) should determine their best use. What He views as important should drive the way we use our time. His design for the Church should permeate all we do. 2) We must be intentional, strategically planning our lives to align with God’s design for Body Life. If living out the one another commands came naturally or automatically for us as believers, we wouldn’t need so many commands. We wouldn’t have to be told to “consider how” we can spur one another on to love and good deed (Heb. 10:24). To get beyond words and good intentions, we must structure for relationships to happen, making sure programs and other items on our agendas don’t prohibit them from happening. 3) We must build margins of flexible time into our schedules. Body life doesn’t always fit into tidy little time slots. It can get messy, requiring more time than we think. If we have ourselves so tightly scheduled that we have appointment backed up to appointment with no wiggle room, we will undoubtedly short-circuit the Body life process more than we care to admit.